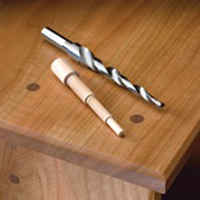 Our dowels are among the most advanced on the market, allowing for easier and faster natural wood joinery. Check out our selection today and see how you can improve your final product. Using our dowels is a simple process, and you only need our product, a drill, a hammer, and glue. It's as simple as drilling a hole, applying glue, inserting the dowel, and tapping it down. Natural wood joinery ensures longer-lasting, more beautiful results. 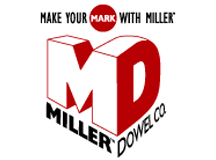 With Miller Dowel Company products, you can enjoy those results faster, easier, and safer. Add natural beauty and strength to your next project without sacrificing speed. 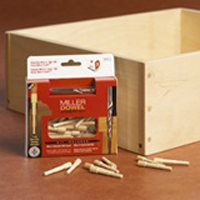 Miller Dowel Company got its start back in 2002 when we patented a design for wooden dowels that combines the advantages of natural joinery with the ease of nails or screws. Today, we build the dowels and bits to fill the holes from our headquarters near Chicago, Illinois. The brainstorm behind this idea was twofold. Owner Philip Haebler's partner was on vacation with his kids in Wisconsin when they brought a sailboat into dock. Over the winter, the wet, the cold, and then the heat had caused nails to start coming out on the dock. He cut his hand on the nails and ended up needing eight stitches. Then later, while he was visiting a friend in the hospital, the IV gave him an idea for the shape of our dowels. We developed the product, put up a booth at a convention, and a big buyer, Woodcraft™ though the idea was amazing. Our products last longer by creating solid joints that are safer than traditional nails. 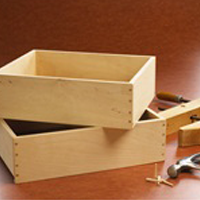 Fewer tools are required, so they're more economical, and they can be used in any woodworking project. The unique fasteners are the only ones designed to be inserted from the outside, and they deliver appealing, durable alternatives to metal fasteners. We offer three sizes of dowels and bits in White Birch, Cherry, Red Oak, and Black Walnut.